Kiké Hernandez’s father gets good news, cancer is in remission. Dodgers utility player Kiké Hernandez got some good news last night: His father, Enrique Hernandez Sr., learned his cancer is in remission. Hernandez’s father received a bone marrow transplant in June, and months of rehabilitation followed. 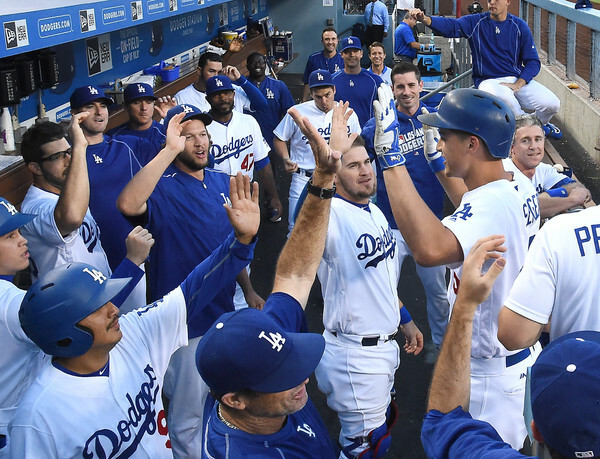 Kiké said that his father shuttled from his home in Puerto Rico to Tampa and back for treatment, all the while watching the Dodgers’ games on TV. Back in June, the younger Hernandez shaved his head as a show of support for his father’s battle. Father’s Day fell shortly thereafter, and Hernandez hit a memorable pinch hit home run in that day’s game against the Milwaukee Brewers, a 2-1 Dodgers win. Today’s news was a long time coming, and Hernandez was understandably in a good mood before Game 4 of the National League Championship Series. Kiké Hernández, Alex Wood added to Dodgers’ roster for NLCS. CHICAGO — Utility player Kiké Hernández and pitcher Alex Wood were added to the Dodgers’ roster for the National League Championship Series on Saturday. They replace infielder Charlie Culberson and utility player Austin Barnes, and give the Dodgers 12 pitchers and 13 position players for the best-of-seven series. Game 139: Dodgers’ latest win is a group effort for their pitching staff. 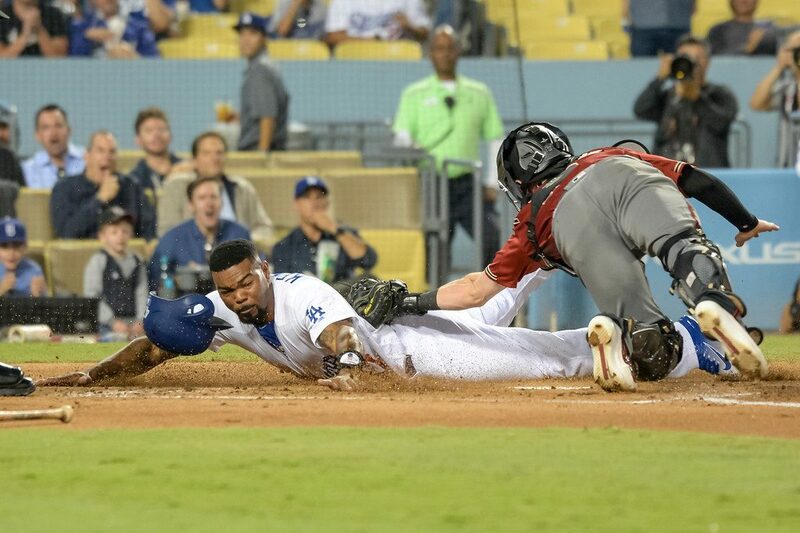 The Dodgers tied a team record by using eight pitchers in a nine inning game, ultimately beating the Arizona Diamondbacks 3-1 to complete a three-game sweep. Kiké Hernandez is going to be in a soap opera. The Dodgers’ front office is having a fun time unearthing hidden gems, writes colleague Mark Whicker. MLB, MLBPA’s $5 million pledge to Puerto Rico hits home for Kiké Hernandez. Hernandez is the only native of Puerto Rico on the Dodgers’ major league roster. A native of Toa Baja, his father is an area scout in Puerto Rico for the Pittsburgh Pirates. The development of baseball in his homeland is deeply personal. The timing of Wednesday’s announcement was also noteworthy. Puerto Rico recently defaulted on about $2 billion in debt payments, prompting Congress to pass a financial aid/oversight bill known as the PROMESA Act. Five million dollars seems like a drop in the bucket by comparison. To Hernandez, every little bit counts. 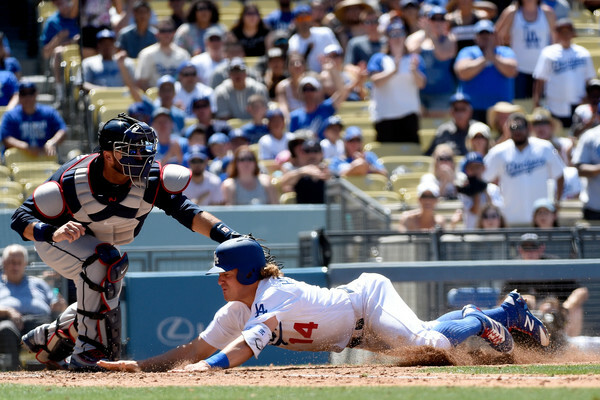 Game 112: Dodgers brush aside Phillies, keep pace in National League West. The Dodgers continued their improbable streak of success without Clayton Kershaw, battering Zach Eflin and the Philadelphia Phillies in a 9-4 win. The box score is here. Rich Hill and Brandon McCarthy are throwing bullpen sessions tomorrow at Dodger Stadium, albeit for very different reasons. Josh Ravin pitched a scoreless ninth inning, allowing only a triple to Cesar Hernandez in his 2016 debut. The Chatsworth native said he wants to “destroy everyone” he pitches to. Ravin also told me after the game that his “Twitter feud” with teammate Kiké Hernandez didn’t require a “clear the air” talk. They didn’t discuss it during their mutual time at the Dodgers’ complex in Arizona earlier in the year.